The report may have also let loose an unannounced content package for TOR. When Star Wars The Old Republic launched during the holidays, there was a lot of hullabaloo over whether it could grab a significant portion of monthly subscribers. Many MMO pundits believed the monthly subscription was an extinct species, although TOR was probably the last great beast of that line. BioWare and its publisher patron Electronic Arts called TOR the "fastest-growing MMO" in history, selling 2 million copies in its first month and holding a 1.7 million population in February. But in an earnings statement released today, EA said the population here in May was 1.3 million. For those of you who are mathematically challenged, that's a drop of half a million people. Or about as many people who live in a city the size of Las Vegas. Last we heard, World of Warcraft had more than 10 million subscribers, even if some might have tried out TOR. 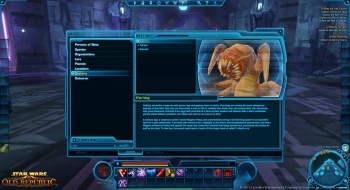 In addition, the report might have leaked the name of an upcoming patch for The Old Republic. Patch 1.2 went live in April, and expanded the popular "legacy" which allowed multiple characters on the same server to share resources and a family tree, as well as earn abilities and goodies. But what is coming next for TOR? "Two new content packs - Legacy and Allies, available in Q1," read the report. We know about Legacy, but I hadn't heard anything about Allies. An expanded guild system perhaps? More companions? I suppose we'll find out soon enough.